An inspirational teenager from Ilford has been honoured for his achievements in the Panathlon Challenge – a ‘mini Paralympics’ for children. 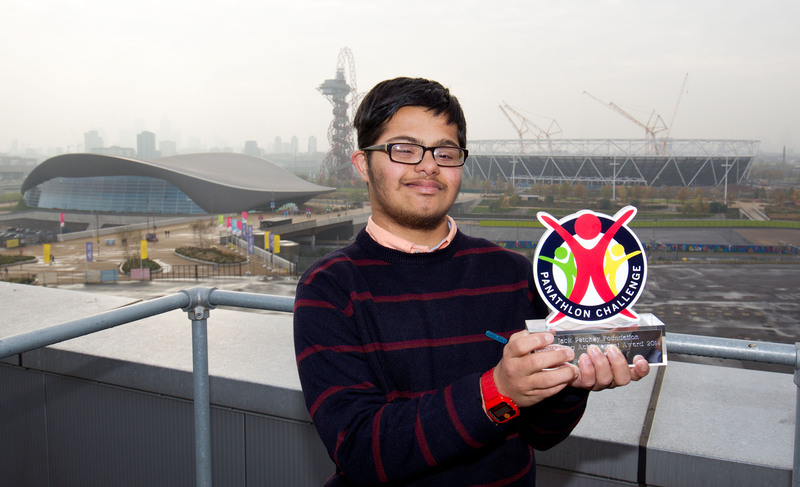 16-year-old Faizan Bidiwala, who has Downs Syndrome and underwent a life-saving heart operation just three years ago, received Panathlon’s top individual honour at the 2014 Jack Petchey Outstanding Achievement Awards, held in the Olympic Gallery at John Lewis Stratford City. The student at Little Heath School in Romford collected his award from triple-Paralympic medallist Liz Johnson, having been selected from a shortlist of five inspirational individuals out of the 4,000 disabled young people to take part in the Panathlon Challenge this year. Faizan arrived in Ilford from Pakistan three years ago with very limited English and a heart condition related to his Downs Syndrome that left him short of breath and jaundiced after even a small amount of exercise, severely restricting his participation in any sport. After recovering from his major heart surgery at Great Ormond Street Hospital, Faizan became involved in Panathlon’s multi-sport competitions, which use adaptive equipment to make them accessible to people with a range of disabilities. He has since gone on to represent his school at boccia and cricket and become a key member of the Redbridge Panathlon team, who won the London Plate Final at the Copper Box Arena in the Olympic Park in June. Panathlon provides sporting opportunities for over 4,000 disabled young people each year. Over 400 schools took part in Panathlon’s 84 ‘mini Paralympic’ competitions in 2013/14, with 35,000 active hours of sport provided to disabled children. Being involved in Panathlon has proved of great benefit to Faizan and his teachers at Little Heath School have seen him develop both in and away from the sporting arena, by making him a team player, giving him a sense of competition and helping to make him gracious in defeat. John Lewis Stratford City have supported Panathlon since the London 2012 Olympic and Paralympic Games. The store overlooks the Olympic Park, where this year’s Panathlon London Final took place at the Copper Box Arena in June. 15-year-old Scott Pope, from Dagenham, was runner-up in the Outstanding Achievement Awards, while 11-year-old Malik Berbiche, from Harefield, was highly commended in third place. David Ejinkonye of St Paul’s Academy in Greenwich was named as the Young Leader of the Year, while Jason Bates of Sherwood Park School in Sutton collected the Sporting Achievement Award.